" documenting the band's developing sound, ideas and ideals through the music and design of their classic 12" single releases "
The start of the decade saw Simple Minds holed up in various recording studios writing their first album of the 1990s. However, they weren’t entirely absent from the public eye as they appeared at the Nelson Mandela Freedom Concert and showcased a series of festivals across Germany. Despite these shows, it left Virgin with a relatively fallow year after the omnipotent excesses of the Street Fighting Years campaign and tour. Therefore they kept the band in the pages of the music magazines and shop window promo displays by releasing a long awaited live video (Verona), a single collection (the Themes ) and an album box set (Simple Minds). 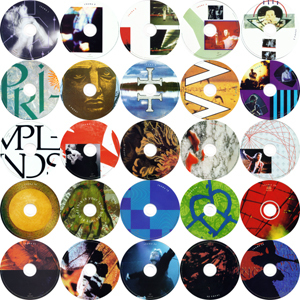 The Themes series was based around the band’s original 12" singles; modernized, repackaged and, most importantly, issued on CD for the first time. By some judicious shuffling of tracks, plus effectively ignoring the original Arista 12" singles, Virgin condensed the sprawling 12" discography into a neat collection of nineteen CD EPs. The packaging was sublime. The individual Themes were initially collected into four box sets called the Themes Volumes . The box could be repeatedly unfolded, each layer revealing another Theme , the last unveiling extensive, authoritative sleeve notes about the origins of each Theme . Additionally Volume 4 included the exclusive Theme 20: The Verona EP which featured three full-length recordings from the Verona concert. Timed to coincide with the end of the band’s brief European Tour, the Themes Volumes appeared at fortnightly intervals throughout September and October 1990. 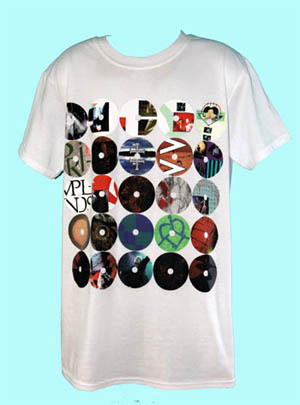 A limited edition T-shirt was suggested as a bonus gift for those who'd collected all four sets but the idea was never followed through. However, although it wasn’t perfect (as some tracks didn’t appear in their correct guises) the Themes Volumes were a most welcome addition to the discography and many fans bankrupted themselves to collect all four sets. The following year, Themes 1 to 19 were issued as a set of separate CDs in jewelcases. Although they weren't picture CDs, and The Verona EP wasn't rightfully included, they corrected the pressing mistakes present in the box sets. The 19 Themes were also issued as cassette singles with slip case sleeves, but the artwork for these was spectacularly poor, and they were never really collectable. Virgin never issued any promos for the original Themes but some reference DATs were produced by Chop 'Em 'Out. Despite hints the series would continue, the Themes were forgotten by the record company until 2008. 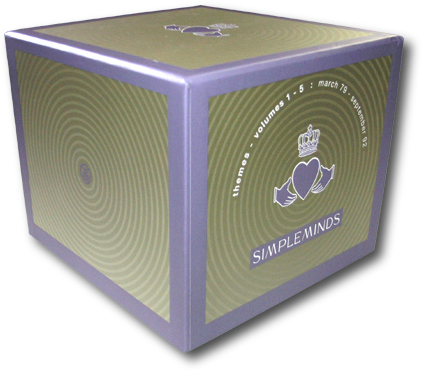 As part of Simple Minds 30th anniversary, the original Themes Volumes were reissued in a single box set, along with a new volume five. Volume five was also made available separately for those who'd already purchased the original four volumes. The fifth volume covered the 12" releases from Real Life and Glittering Prize 81/92. Unlike the previous Themes Volumes , the contents of the set had already been issued on CD (with the exception of one track), and no bonus material was forthcoming. Coupled with the perfunctory sleeve notes, the fifth volume was a disappointing conclusion to the series. A special edition T-shirt was sold at Koko concert in London which featured the Dream Giver design used at the top of this page.